One of the objectives of the management is to establish a sound organisational structure and to do this, effective authority and responsibility relationship should be created, i.e. Who is accountable to whom? Who are superior and subordinate? Who can give orders? Whenever authority is used, responsibility ensues. Authority is the legal right to give the command, order or instruction and compel the subordinates to do a certain act. On the other hand, Responsibility is the outcome of authority. It entails the obligation of the subordinate, who has been assigned the duty by his superior. Thus, these two are coextensive and commonly misconstrued by the people, however, they are different. 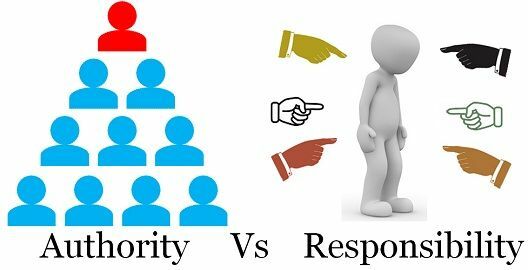 This article attempts to describe the difference between authority and responsibility, take a read. Meaning Authority refers to the power or right, attached to a particular job or designation, to give orders, enforce rules, make decisions and exact compliance. Responsibility denotes duty or obligation to undertake or accomplish a task successfully, assigned by the senior or established by one's own commitment or circumstances. What is it? Legal right to issue orders. Corollary of authority. Requires Ability to give orders. Ability to follow orders. Objective To make decisions and implement it. To execute duties, assigned by superior. Duration Continues for long period. Ends, as soon as the task is accomplished. We define ‘authority’ as the legal and formal right of the manager or supervisor or any of the top level executives, of the organisation to command subordinates, give them orders, instructions and directions, and access obedience. The manager is entitled to make decisions, concerning performance or non-performance of a task in a particular manner, so as to accomplish organisational objectives. It comprises of some permissions and the right to act for the organisation in a particular area. Authority is derived by virtue of the position of an individual in the organisation, and the degree of authority is maximum at the top level and decreases consequently as we go down the corporate hierarchy. Therefore, it flows from top to bottom, giving authority to superior over the subordinate. One cannot occupy a superior position in an organisation if he does not have any authority. It is the authority; that distinguishes one position from that of another and vests the power to the concerned individual, to order his subordinates and obtain necessary compliance. Official Authority: The authority which gives the manager, power to command his subordinates, by virtue of his designation in the organisation. Personal Authority: It indicates the ability by which a person influences the behaviour of other persons in an organisation. Responsibility is the obligation of an individual, whether a manager or any other employee of the organisation to carry out the task or duty assigned to him by the senior. The one who accepts the task are held responsible for their performance, i.e. when an employee takes the responsibility of an action, at the same time, he becomes responsible for its consequences too. The obligation is the kernel of responsibility. It is originated from the superior-subordinate relationship, formed in an organisation. Hence, the manager can get the tasks done from his subordinates, by virtue of their relationship, as the subordinate is bound to perform the tasks assigned. The power or right, inherent to a particular job or position, to give orders, enforce rules, make decisions and obtain conformity, is called authority. Duty or obligation to undertake and complete a task satisfactorily, assigned by the senior or established by one’s own commitment or circumstances is called responsibility. Authority refers to the legal right of the manager to give orders and expect obedience from subordinates. On the other hand, responsibility is the corollary, i.e. result of the authority. The position of an individual in an organisation determines his/her authority, i.e. the higher the position of a person in the corporate ladder, the more is the authority and vice versa. As against this, the superior-subordinate relationship forms the basis for responsibility. While authority is delegated, by the superior to subordinates, responsibility is assumed, i.e. it is inherent in the task assigned. Authority needs the ability to give orders and instructions, whereas responsibility demands the ability of compliance or obedience, to follow orders. Authority flows downward, i.e. the extent of authority is greatest at the top level and lowest at the low level. On the contrary, the responsibility exacts upward, i.e. from bottom to top, the subordinate will be responsible to superior. The purpose of the authority is to take decisions and execute them. Conversely, responsibility aims at executing duties assigned by the superior. Authority is inherent with the position, and so it continues for a long period. Unlike responsibility, which is attached to the task assigned and hence it is short-lived, it ends as soon as the task accomplishes successfully. A point to remember in connection with authority and responsibility is that while assigning certain responsibility to an employee, the required amount of authority should also be conferred on him so that he/she can be able to perform it. Hence, the delegation of authority can only be effective when it matches with the assigned responsibility, i.e. if the authority assigned to a person is greater than the responsibility, it ultimately results in the misuse of authority. Likewise, if the responsibility assigned is greater than the authority, then also the tasks will not be carried out properly due to the lack of necessary authority, thus making it ineffective. So, a balance should be maintained between the authority and responsibility. Thanks for this clear concept.